Quality dining, intimate restaurants, cafes - all within 10-15 minutes walk of our home. 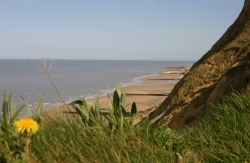 The coastal town of Sheringham is in a thriving, bustling area of Norfolk, with the prestigious claim to being an area of outstanding natural beauty. The town boasts it’s own “Little Theatre” which plays host to all kinds of arts, from children’s entertainers, cinema, comedy acts to art exhibitions. With it’s own superb coffee shop and bar this facility provides an excellent evenings entertainment. In Upper Sheringham , a ten minute drive from Myrtle House, you can visit Sheringham Park and join one of the many guided walks through the park. This is a National Trust facility. Situated in the town is the Museum, which also is a venue for talks on various local points of interest. Then of course there is the famous Poppy Line Steam Railway which offers a variety of special weekends e.g. 1940’s weekend, Murder Mysteries and Christmas Specials, along with the traditional journey up to Holt, visiting Weybourne on the way. A wonderful experience, not to be missed! 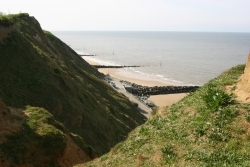 Cromer is situated 4 miles by road, or an energetic walk along the cliff path from the back garden of Myrtle House . There you can find a traditional seaside town, complete with Pier! Try fishing for crabs - it is great fun. There are boat trips to see the seals at Blakeney Point, the Mukleburgh Collection - Norfolk's largest working Military Museum, animal sanctuaries and many, many more attractions. There are numerous hostelries in the Town that offer refreshments from a quick snack to full a la carte, including traditional fish & chips to a good selection of ethnic foods such as Thai. We can advise you about where to go and in some cases where you can obtain a small discount when you mention Myrtle House! Emotional, Beautiful, Ugly, Exciting, Soothing - it is whatever it feels like from day to day, but is a fantastic place to sit and gaze for hours, plus being one of the cleanest and safest in the UK. The beach has won awards for being one of the cleanest in the UK. We hope that this has been useful but please do not hesitate to contact us if you would like more information about anything specific or if you would like us to put a package together for you.